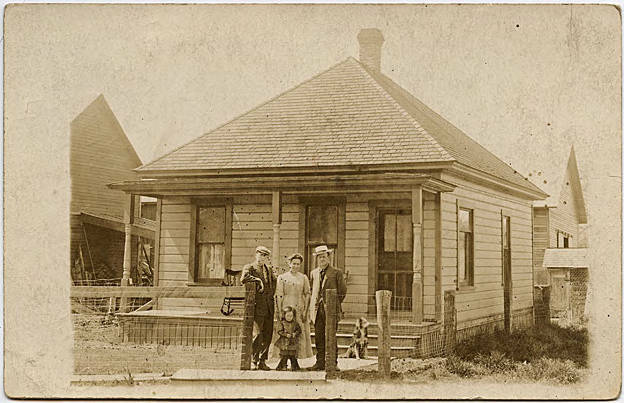 Sepia-toned image of a family standing in front of their home. A man and an older boy stand on either side of a woman; they wear suits, the boy has a newsboy style cap and the older man a straw boater style hat. The woman's hair is up in a loose bun, and she wears an ankle-length dress with elbow-length sleeves and that buttons down the front to her left. A small child with long curls stands in front of her, wearing an outfit made of dark material with white polka-dots. It has long sleeves and short pants, and buttons down the front to the child's right side. A dog sits on the walkway behind them. The house is small, square, with a pyramidal hipped roof and a front covered front porch. Wire fencing surrounds the small yard, and an outhouse can be seen in the back of the yard, just in front of a fence that separates the yard from what appears to be a large barn or garage. 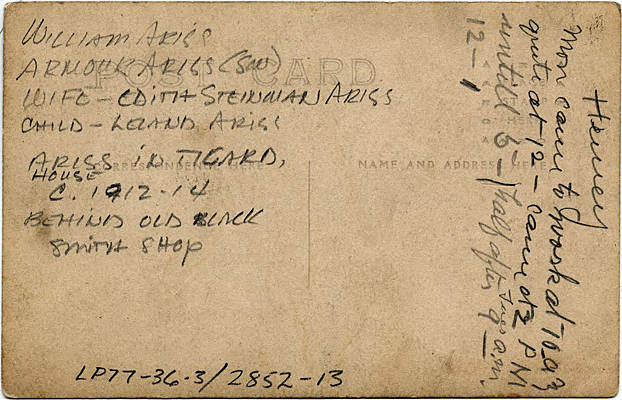 [back] William Ariss, Armour Ariss (Son), Wife - Edith Steinman Ariss, Child - Leland Ariss. Ariss house in Tigard, c. 1912-14. Behind old black smith [sic] shop. [pen] Henry. Mon came to work at 10 a.m. quit at 12 - came at 2 p.m. until 5 - | half after 9 - Tues. a.m.. 12 - 1.